Safe Passage Project is proud to feature Joe Francoeur as our Attorney of the Month! 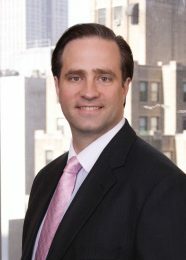 Joe is a partner at Wilson Elser where he specializes in professional liability defense, federal statutory litigation, commercial disputes and insurance coverage matters. In 2014, Joe was appointed to his firm’s national pro bono committee; his first order of business was to find an initiative to get more attorneys involved in pro bono. “I wanted to find a program that would offer training, oversight, and a really good cause,” Joe explained. “My theory is that more people would get involved in pro bono, but, they are worried to step out of their comfort zones.” Safe Passage fit the criteria and an initial training for 40 attorneys was scheduled. Joe explained that over 189 attorneys actually showed up for that first training, demonstrating the tremendous interest within the firm. Safe Passage is proud to now be Wilson Elser’s biggest pro bono project, thanks to Joe’s foresight and leadership. Thank you Joe for your commitment to Safe Passage and the children we work with. You are an example for others to follow and we are grateful for you and your firm’s dedication to pro bono initiatives. We look forward to continuing our strong partnership on future cases. and from court and to meet her attorney. see if we can help. Pro bono attorneys and other volunteers are critical to the Safe Passage Project model.